The quality of cement should be examined properly prior to utilize it in concrete, plastering or any other purpose at construction work site. For quality checking, initial inspection is very crucial. It may not always feasible to check all the engineering qualities required for utilizing cement on site but the quality of cement can be checked roughly through some recognized field test in the construction site. But the other crucial tests should be performed in laboratories. 1. Date of Packing Cement: Before purchasing cement, make proper investigation regarding the date of manufacture provided on the cement bags. It is very crucial since the strength of cement is decreased with age. 2. Colour: The color of cement should be consistent. Usually, the colour of cement remains grey with a light greenish shade. The colour of cement symbolizes surplus lime or clay and the degree of burning. 3. Rubbing: Take a pinch of cement among fingers and rub it, It should appear smooth at the time of rubbing. If it feels rough, there is adulteration with sand. 4. Temperature Test of Cement: Push your hand into the cement bag and it should feel cool. It means that there is no hydration reaction in the bag. 5. Float Test: Provide a small quantity of cement in a bucket of water. It should submerge and should not float on the surface. 6. Smell Test: Select a bit of cement and smell it. If there is excessive pounded clay and silt as an adulterant in the cement, the paste will provide an earthy smell. 7. Existence of Lumps: Open the bag and check that no lumps exist in the bag. It will make sure that no setting has occured. 8. Shape Test: Select 100g of cement and make a stiff paste. Make a cake with sharp edges and placed on the glass plate. Submerge this plate in water. Verify that the shape should remain as it is at the time of settling. It should have the capability for being set and obtained strength. 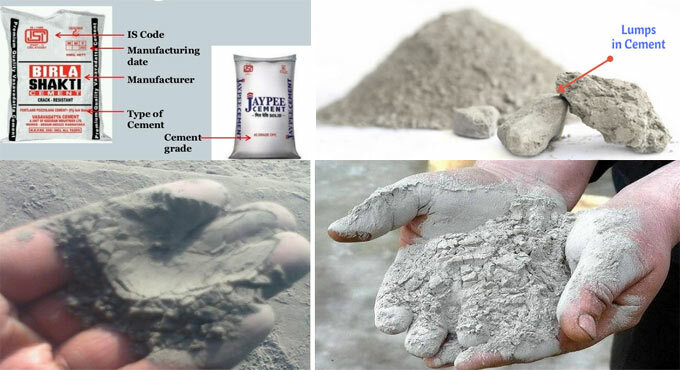 Cement has the capacity of being set under water also and for this reason it is known as ‘Hydraulic Cement’. 9. Strength of Cement Test: A block of cement 25 mm*25 mm and 200 mm long is arranged and absorbed for 7 days in water. It is then set on supports 15000 mm apart and it is loaded with a weight of 340 N. The block should not demonstrate any sign of failure.